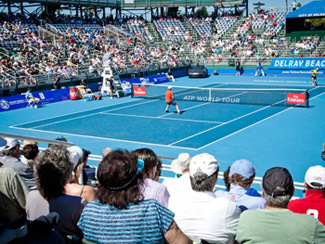 The intimate main stadium at Delray. It's been said that small is beautiful. But in my view small can also be big. This year I am going back to the Delray Beach Open for the third time. And I advise you to head there as well—and email me when you arrive! Delray is a beautiful place for sure. A relatively small, long established beach town with a mixture of trendy and funky. But the Delray Open is big in my mind because of the opportunity to see some of the best players in the world in a series of intimate venues. 15 years ago or more I started covering Indian Wells. At the time it was a relatively undiscovered jewel. You could move around the stadiums. You could just walk up and stand in the front row on the practice courts. As great as the event has become, neither of those is remotely possible there now. Delray though has that same feel that Indian Wells had years ago. The stadiums are relatively small and although there is good attendance, it's not packed up tight—especially in the early days. The practice courts? You can still get in the first row.